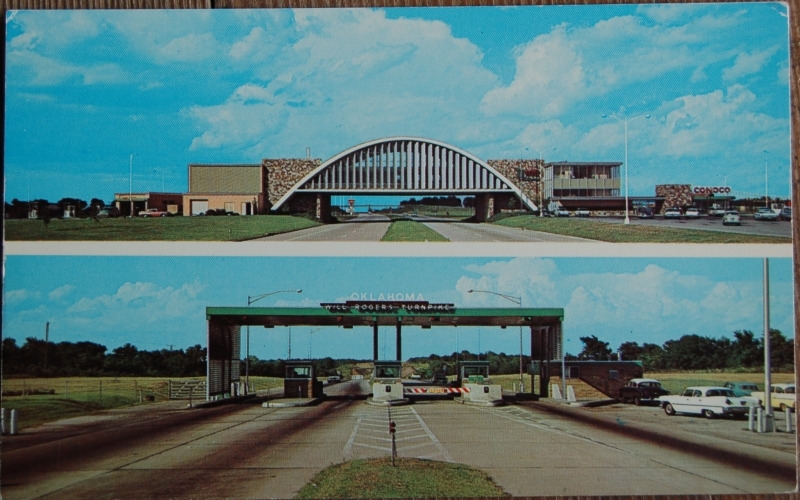 Composite view of this super highway which connects Tulsa, Oklahoma; Miami, Okahoma and Joplin, Missouri. Top: The ultra-modern GLASS HOUSE RESTAURANT which spans the highway at its midway point. Ah, it was foretold to me this morning I would like today's boring postcard! I do, because I once visited the GLASS HOUSE RESTAURANT in its circa-1990 incarnation as THE WORLD'S LARGEST McDONALD'S--largest due to the prodigious square footage taken up by restrooms, stairs and corridors, of course, and not due to sales. But a real bright spot in the drive across Oklahoma nevertheless. And somewhere in this house is a lovely postcard of it. Perhaps someone out there has visited more recently? Stunning. Seeing as the tollbooth is modern and the restaurant is ultra-modern, and I know post-modernism was a thing, what are we now? Does the term "modern" now necessarily come to denote the past? Will "future" one day meet the same fate, requiring us to continually concoct new words for the time that is now and the time that is yet to be? I think we should go back to naming eras after the monarchs. That kind of ended with Victorian. Although we do have Stalinesque. Do the Americans call that stuff (cause if you don't believe they built it, go and look at the FAA building at the airport in Oklahoma City) Eisenhoweresque? Thus the tollbooths they build today in Oklahoma represent Barack era architecture. They could confuse the issue by building them with little columns, spires and flourishes, making it baroque Barack. @aviatrix: We don't really know what we are now, of course, which is maybe intrinsic to the human condition. If you pick up any architecture mag, you'll conclude that modernism is still alive and well. Whereas post-modernism was a brief flash-in-the-pan, architecturally. "Modernist" makes it clear you're referring to a style, not a time. And Futurist is dead and gone, but futuristic is still possible, though more often then not tinged with nostalgia. Whereas the future? Just a verb tense? It's all rather muddled! As for Stalinesque, The Seven Sisters of Moscow so clearly had Chrysler Building envy that it's just a little sad. I visited the Soviet Union before seeing the great architectural monuments of the American 1950s, so for me the style is Stalinesque first. I didn't think it represented copying so much as a general gestalt of the era, though. It seemed to be a decade that celebrated massive and industrial. They had figured out how to create vast concrete structures, and by god or man, they were going to do it!